The economic enhancement of South Asian countries is not significantly reflects the child nutritional status over the past few decades. Many socioeconomic and demographic factors are liable for child nutrition. Height-for-age (stunted), weight-for-age (underweight), and weight-for-height (wasting) are the most significant indicators for measuring child nutritional status. According to the United Nations International Children's Emergency Fund, malnourished people do not take adequate calories and protein for proper growth and maintenance of good health. Malnutrition of fewer than 5 years children is one of the most alarming problems in worldwide. Around the world, ≥50% of all childhood death occurs due to malnutrition., In a study, Stevens et al. show that 30% of children below the age of 5 years around the world is moderately or severely stunted and about 19% is moderately or severely underweight. Child malnutrition yet remains a major health-related problem in developing country like Bangladesh. Here, 36.2% of children are stunted, 15% are wasted, and 33% are underweight. The prevalence of stunting or underweight is lowest among children aged 0–6 months and highest at the age of 18–23 months (stunted 48% and underweight 37%). Among the developing countries, the prevalence rate of child malnutrition was highest in Pakistan. In developing countries, the rural-urban disparities in child nutrition outcomes remained persistent since long presumably due to the difference in economic levels and poor accessibility to health facilities, education, and other factors. Only 23% of the men knew the correct timing of the first checkup during pregnancy. Malnourished children suffer from different physical and intellectual difficulties. Although in the past two decades, the overall growth rate of stunt prevalence has decreased, and in South Asia and sub-Saharan Africa at least 165 million children are globally affected by malnutrition within 2011. The report of Bangladesh Demographic and Health Survey (BDHS) 2011 shows that under 5-year stunted child are 41%, where it was 43% in BDHS, 2007. The Ministry of Health and Family Welfare initiated the Health, Population, and Nutrition Sector Development Program for 5 years, from July 2011 to June 2016. Similarly, 33% of under-five children were identified to be underweight in 2011 which is a marginal increase compared to 42% in 2007. According to BDHS 2014, it is explored that stunted (low height-for-age), wasting (low weight-for-height), and underweight (low weight-for-age) children are 36%, 14%, and 33%, respectively. However, the World Health Organization (WHO) investigated that 24.7% children are stunted (height-for-age), 7.8% are wasting (weight-for-height), and 15.1% are underweight (weight-for-age) in 2014 in worldwide. The proportion of severely malnourished and moderately malnourished children were found higher among the children aged 12–23 months (18% and 41%), having <24 months birth interval (13% and 35%), illiterate (17% and 38%), and acutely malnourished mothers (18% and 40%), worst child feeding status (16% and 36%), and experienced with several diseases such as diarrhea, acute respiratory infection, and fever (nearly about 50% malnourished separately). Many researchers have tried to find out the actual child malnutrition risk factors on the basis of several statistical methods such as binary logistic regression model, ordinal logistic regression model, and multinomial logistic regression model.,,, Recently, Das and Gulshan conducted a study to determine the significant risk factors for child malnutrition by applying a binary logistic regression model, and Talukder also carried out a similar study on under 5-year child nutritional status using BDHS, 2014 data. The main objective of this study was to identify the factor behind the malnutrition of the children of under-five age in Tangail district. To measure the pattern and strength of the relationship between the influential factors with malnutrition is also the main focus of the study too. Based on the previous works,,,,, and using the proportional odds (PO) model, we have tried to meet the objective of the study. The objective of the study is to test whether the mother education and/or occupation have an effect on child nutrition status. In this study, cluster sampling technique was used to collect data from the villages. Ethical approval had been taken from concerned authority with ref no. MBSTU/EC/Jan/18. The clusters were selected using the systematic probability proportionate to size sampling procedure. From January 2018 to March 2018, the information from a sample of 242 households was collected from eight villages, where each village considers as cluster and from each of the cluster 30 households were covered. Before collecting the information, the objective of the study is clearly explained to the respondents. If respondents are not interest to provide the information he or she was not included in this study. Furthermore, a household was included in the study if the household has a child under-5 years, otherwise the household was not interviewed. To meet the objective, both univariate and multivariate analysis was used. The significant factors behind the malnutrition of fewer than five children were studied using crosstab analysis and PO. Statistical Software, Statistical Packages for Social Sciences (SPSS) version 21.0 (IBM Corp., Armonk, NY, USA) was used for analysis purposes. The dependent variable, child nutritional status was calculated based on weight-for-age Z-scores (WAZ), the nutritional status of children is divided into three categories: severely malnourished (<−3.0 WAZ), moderate malnourished (−3.0–−2.01 WAZ), and nutritious (≥−2.0 wake). The WAZ is calculated using the WHO AnthroPlus Software (Geneva, Switzerland) (version 3.2.2, 2011). The important independent variables are mother education, body mass index (BMI), occupation, age, and income. Where, Ns is the number of concordant pairs and Nd is the number of reversed pairs. The test statistic gamma ( ) follows a normal distribution with mean (γ) and standard error which calculated from the delta method. Here, the statistic Chi-square follows a Chi-square distribution with (r − 1) (c − 1) degrees of freedom (df), where r is the number of categories of the covariate and c is the number of categories of the response variable. 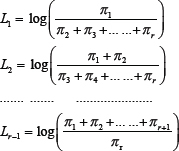 This equation describes the log-odds of two cumulative probabilities, one less-than, and the other greater-than type. This measure expresses how likely the response is to be in category j or below versus in a category higher than j. Notice that (unlike the adjacent-category logit model) this is not a linear reparameterization of the baseline-category model. The cumulative logits are not simple differences between the baseline-category logits. Therefore, the above model will not give a fit equivalent to that of the baseline-category model. This model, called the PO cumulative logit model, has (r − 1) intercepts and P slopes, for a total of r + P − 1 parameters to be estimated. [Table 1] shows that as the level of education increased the risk of child malnourished decreased. The table clearly shows that education, occupation, age, mother's BMI, monthly income; types of house, types of toilet, and source of the lighting of house have a significant association with child nutritional status. Based on gamma estimates, it can be estimated that nutritional status has a significant negative association with age and mother's BMI. The percentage of severely malnourished and moderately malnourished was found higher (36.8% and 44.7%, respectively) for illiterate respondents. Respondent occupation is also identifying an important factor. Although Bangladesh has already achieved a remarkable progress in reducing child malnutrition from 68% in the late 1980s to 41% in 2007, still malnutrition is a common problem in this country. The person who involve in agriculture activities probably get less time to take care his/her babies also less educated. As a result, children in this family have a high chance for malnourished. The table also confirms the results (36.7% and 42.9% severely malnourished and moderately malnourished, respectively). Normally, it is think that as the income increased the probability of malnutrition decreased. The table shows almost similar results for income category. The type of building is an important indicator of household economic status. The study tries to identify the malnutrition status of the child in respect of housing condition and type of toilet also. The family who live in a building with sanitary toilet facility has less chance of child malnourished. All these selected covariates were found significantly related to the nutritional health status of children (P < 0.001). PO models can properly measure the significant effect of the selected covariates. The Chi-square test for final model (χ2 statistic = 58.602, df = 17, P = 0.000) indicates that the model gives a significant improvement over the baseline intercept. The deviance-based Chi-square test shows parallel lines assumptions are satisfied (χ2 statistic = 377.5, df = 395, P = 0.728), which indicates that a single parameters can be used for each selected covariates to models separate logits of cumulative probabilities. The estimated effects are shown in [Table 2]. 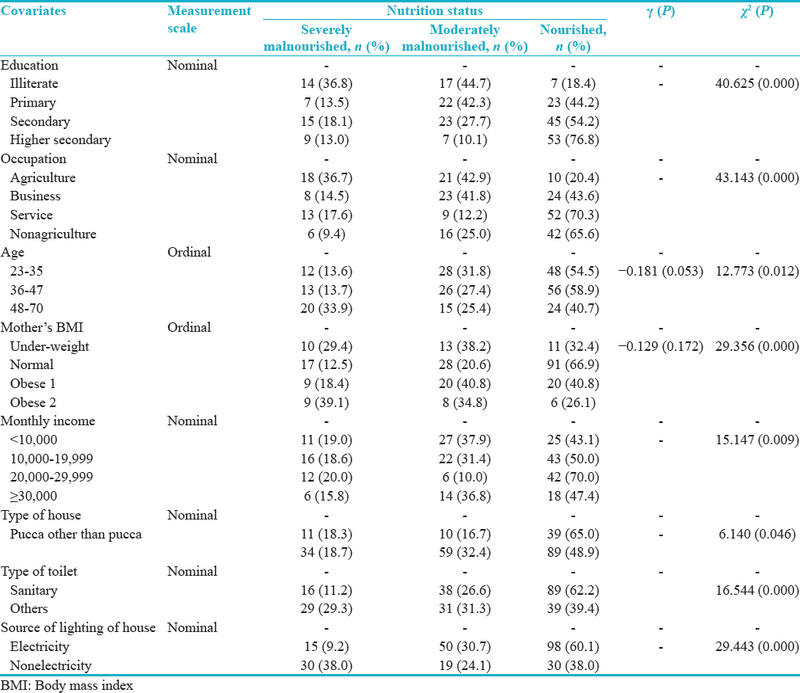 The table shows that the odds of staying in worse nutrition status (severely and moderately malnourished) was (1-exp [−1.719]) =82% lower for the children belongs to primary educated mothers (P < 0.002) compared to the illiterate mothers. That is as the level of mother's education level increase the chance of malnourished decrease. Compared to the children belongs to the family whose household head occupation were nonagriculture work, the odds of changing nourished to malnourished nutritional status of the children were 64% and 40% lower for the children from the household whose household head occupation were business and service, respectively. One possible reason for this may be nonagriculture occupation-based family has less care to their children. For the age category of the mothers, the table shows that the odds of malnourished child was 72% higher for mothers belonging to 23–35 years of age groups compared to 48–70 years of age groups mothers. One interesting finding is that for the age category 36–47, the risk of malnourished child increased significantly. This may be due to the fact that these age groups mothers are more involve in income generating activities so that they have less time to take care their baby. Children with under weighted mother had 3.51 times more chance of staying in the malnourished state of nutritional status compared to children with extreme obesity mothers. The risk decreases for normal-weighted mothers followed by obese mothers. According to the monthly income category of the family, the risk of having malnourished children was 1.798 times higher for low income category compared to high income category. The PO models show that type of house does not have any significant effect on children nutritional status though the bivariate analysis shows a significant relation. One surprising finding of the studies is that type of toilet has a significant effect on children nutritional status. Family those have sanitary toilet have less chance of malnourished child compared to others toilet facility family. 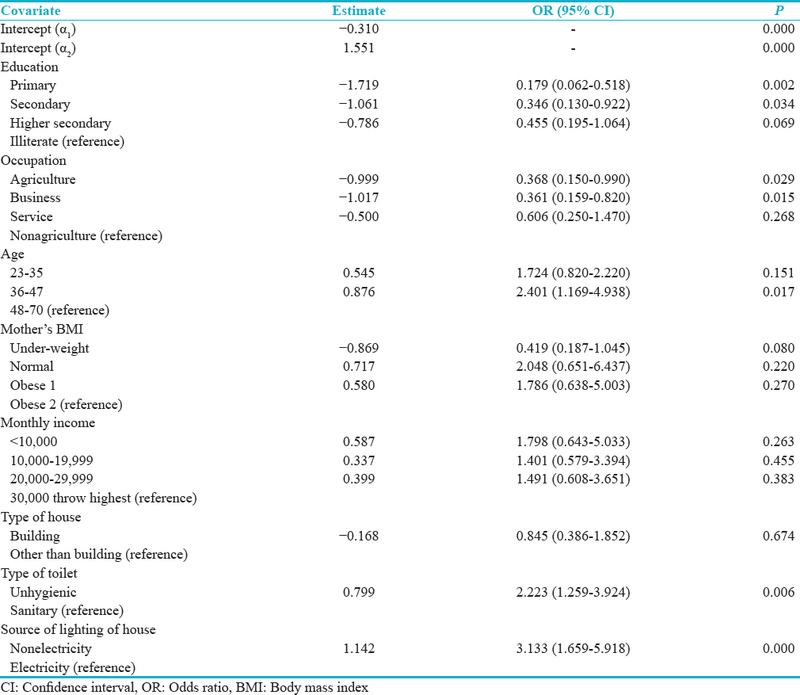 The same is true for the source of lighting factors also [Table 2]. The reason behind the study was to identify the factors which are associated with malnutrition in Tangail area and we found that, the possible causes associated with child malnutrition are education levels, occupation, mother's BMI, household monthly income, economic status, number of children, types of toilets, and home lighting sources. Another important reason behind this is the children of rural areas that are being depriving from different social facility. The result of this study shows that about 18.6% children are severely and 28.5% children are moderately malnourished, which is a little less than the last few decades. Among them 38.8% children were malnourished, and most (56.5%) of the child's from nuclear family and 43.5% were in joint family. This study was carried out to understand the individual and overall effect of the factors behind malnutrition. From the bivariate analysis, it was found that education, occupation, age, mother's BMI, monthly income; types of house, types of toilet, and source of lighting of house were significantly associated with the child nutritional status. On the other hand, considering the growing nature as the dependent variables, the ratio of the corrected effects of the selected covariate in PO model was used. In addition, mother's BMI had a significant negative impact on child malnutrition, indicating that mother with healthy maternal condition have less risk of having malnourished children. In the present, malnutrition of <5 years children is one of the major problems in all over the world. An alarming number of child deaths due to malnutrition. A child who suffer from malnourished have different physical and psychological problem. In the last 20 years, the percentage of malnourished child decrease though in Bangladesh under-five child malnourished rates is still alarming. The report of BDHS 2011 shows that, under 5-year stunted child are 41% where it was 43% in BDHS 2007. Many studies try to identify the factors behind child malnutrition. This study also tries to find the determinant of child malnutrition in Tangail by applying appropriate statistical method. The study shows that to achieve better nutrition levels among the under-five children in Bangladesh, the results of this article highlight the need to increase mother education level, the need for increasing stability of maternal health, and increasing the facility of household basic requirements. Therefore, the study recommend that policy makers needs to implement more programs related to child health in every section of Bangladesh to improve the nutritional status of the child. The study collects information about under-five children from their mother. In rural Bangladesh many mothers are not educated so as they are not concern about their child health. Some of them are not provide accurate information. A minor part of mothers also provide information based on perception. It will be better if proper medical document was available in support of their health status. Gupta MD. Death clustering, mother's education and the determinants of child mortality in rural Punjab, India. Population Stud 1990;44:489-505. Talukder A. Factors associated with malnutrition among under-five children: Illustration using Bangladesh Demographic and Health Survey, 2014 data. Children (Basel) 2017;4. pii: E88. NIPORT. National Institute of Population Research and Training, Mitra and Associates, and Macro International, Bangladesh Demographic and Health Survey Dhaka; 2014. Available from: www.niport.gov.bd/document/research/BDHS-2014-Final-Report.pdf. [Last accessed on 2018 Aug 09]. UNICEF. Progress for Children: A World Fit for Children Statistical Review; 2007. Available from:https://www.unicef.org/progressforchildren/2007n6/index_41855.htm. [Last accessed on 2018 Aug 09]. Meshram II, Arlappa N, Balakrishna N, Mallikharjuna Rao K, Laxmaiah A, Brahmam GN, et al. Trends in the prevalence of undernutrition, nutrient and food intake and predictors of undernutrition among under five year tribal children in India. Asia Pac J Clin Nutr 2012;21:568-76. Demissie S, Worku A. Magnitude and factors associated with malnutrition in children 6–59 months of age in Pastoral community of Dollo Ado district, Somali region, Ethiopia. Sci J Public Health 2013;1:175-83. Stevens GA, Finucane MM, Paciorek CJ, Flaxman SR, White RA, Donner AJ, et al. Trends in mild, moderate, and severe stunting and underweight, and progress towards MDG 1 in 141 developing countries: A systematic analysis of population representative data. Lancet 2012;380:824-34. Das S, Gulshan J. Different forms of malnutrition among under five children in Bangladesh: A cross sectional study on prevalence and determinants. BMC Nutr 2017;3:1. Di Cesare M, Bhatti Z, Soofi SB, Fortunato L, Ezzati M, Bhutta ZA, et al. Geographical and socioeconomic inequalities in women and children's nutritional status in Pakistan in 2011: An analysis of data from a nationally representative survey. Lancet Glob Health 2015;3:e229-39. Srinivasan CS, Zanello G, Shankar B. Rural-urban disparities in child nutrition in Bangladesh and Nepal. BMC Public Health 2013;13:581. Bishwajit G, Tang S, Yaya S, Ide S, Fu H, Wang M, et al. Factors associated with male involvement in reproductive care in Bangladesh. BMC Public Health 2017;17:3. World Health Organization. World Health Statistics 2011. Geneva, Switzerland: World Health Organization; 2011. Available from: http://www.who.int/gho/publications/world_health_statistics/EN_ WHS2011_Full.pdf. [Last accessed on 2018 Aug 09]. Black RE, Victora CG, Walker SP, Bhutta ZA, Christian P, de Onis M, et al. Maternal and child undernutrition and overweight in low-income and middle-income countries. Lancet 2013;382:427-51. Barrera A. The role of maternal schooling and its interaction with public health programs in child health production. J Dev Econ 1990;32:69-91. Bangladesh Demographic and Health Survey 2011. Preliminary Report. National Institute of Population Research and Training Ministry of Health and Family Welfare Dhaka, Bangladesh; 2011. Available from: https://www.dhsprogram.com/pubs/pdf/fr265/fr265. pdf. [Last accessed on 2018 Aug 09]. National Institute of Population Research and Training, Mitra and Associates, and Macro International. Bangladesh Demographic and Health Survey 2014. Dhaka: NIPORT, Mitra and Associates, and ICF International. NIPORT; Eklashpur, Bangladesh; 2016. Bangladesh Demographic and Health Survey 2014. National Institute of Population Research and Training Ministry of Health and Family Welfare Dhaka, Bangladesh Available from: www.niport.gov.bd/document/research/BDHS-2014-Final-Report.pdf. [Last accessed on 2018 Aug 09]. World Health Organization. World Health Statistics 2014. Geneva, Switzerland: World Health Organization; 2014. Available from: http:// www.apps.who.int/iris/bitstream/10665/112738/1/9789240692671_ eng.pdf. [Last accessed on 2018 Aug 09]. Rajaretnam T, Hallad JS. Determinants of nutritional status of young children in India: Analysis of 1992-93 NFHS data. Demography 2000;29:179-200. Rayhan MI, Khan MS. Factors causing malnutrition among under five children in Bangladesh. Pak J Nutr 2006;5:558-62. Das S, Hossain MZ. Levels and determinants of child undernutrition in Bangladesh. Pak J Stat 2008;24:301-23. Das S, Hossain MZ, Islam MA. Predictors of child chronic malnutrition in Bangladesh. Proc Pak Acad Sci 2008;45:137-55. Goodman LA, Kruskal WH. Measures of association for cross classifications. J Am Stat Associations 1954;49:732-64. Mamun AA, Hossain MD, Afrin Aynee M, Majumder D, Ahmed M, Hossain A, et al. Nutritional status of 7-12 years children from rural part of Rangpur city, Bangladesh. Eur Acad Res 2017;4:8436-48. Md Sazedur R, Ali M, Nam FA. Contributing factors to under-five child malnutrition in rural Bangladesh. JOJ Case Stud 2017;4:555633.